This mantra of Lord Shiva is recited for material and spiritual attainment. Of all the images of Hindu gods, that of Siva particularly as Nataraja or Dancing Siva, has won international esteem. In that image, Siva is conceived as the embodiment of Eternal Energy, engaged in the five-fold activity (Pancha-Kritya) of creation, preservation, destruction, obscuration and salvation. It indicates cosmic activity. Siva dances on the body of Apasmara purusha who represents the ego, ignorance, original sin or soul's illusion. By trampling upon him Siva points out that wisdom consists in destroying the same. In one of his upper arms, Siva holds the kettle-drum whose sound symbolises creative energy. The other upper arm holds the fire pot of destruction. The lower right hand shows abhaya ('Do not fear') mudra. The lower left-hand points to the Lord's lifted foot saying "Your salvation lies in worshipping my feet!" Sometimes the deer is shown in one of his hands. The mind is equated to it; control of mind is suggested by it; control of mind is thus taught. The frame-work with lighted lamps, at the back of the idol, represents the dance of Prakriti or Nature, reflecting the dance of wisdom. At the base of the crown of hair on Siva's head is a skull. It is symbolic of Siva's destroying energy. River Ganga on his head denotes fertility. 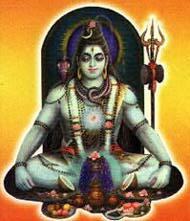 The cresent-moon on his head (Siva is Chandra-sekhara) signifies Siva's grace and also Time. The Cobra on his head indicates Kundalinishakti at Sahasrara-chakra. His third eye stands for omniscience or wisdom. When Hindus wear kumkum or sandal-paste on their forehead, it is to remind themselves of their latent power of wisdom to which they should awaken. On the right ear, Siva wears makara-kundala, signifying the male principle and on the left tatanka (being Ardhanarisa) denoting the female principle. His necklace of skulls of Brahma, Vishnu and others proclaims that he is the arbiter of numberless creations and destructions. The ashes smeared all over Siva's body are symbolic of purity. By wearing it we remind ourselves that in the love of transient Samsara we should not lose sight of God. The body will end up in ashes. Beads of rudraksha he wears represent the solidified tears of pity Siva shed at the woes of his bhaktas. Wearing rudrakshas then, on our body, reminds us of Siva's concern for us and the need for deserving his grace by our steadfast devotion to him. The Upavita or sacred thread, consists of 96 strands representing the 96 tattwas. Siva's wearing it proclaims that he is the arbiter of all actions. The Cobra's coiling round Siva is symbolic of the cosmic force about him. The tiger skin he wears tells us that we must strip ourselves of ahankara or pride which is equated to the tiger. Driving away maya, burning karma, crushing the ego and raising Jeeva by grace-these are said to be the works of the Lord's dance during pradoshas. Its deepest significance will be felt when it is visualised that it should take place in our heart. Then will the realization come that the Kingdom of God is within and God is everywhere. Siva destroys not only the heavens and the earth but also the fetters that bind each separate soul. The burning ground of Siva is the heart of the bhakta where their selves are to be destroyed; where their illusions and doubts have to be burnt away. Siva Nataraja according to some is the same as Panchakshara. His feet are Na; navel-Ma; shoulders-Si; face-Va and head-Ya. The Vrishabha or bull that Siva rides is Dharma. The Nandi before Siva temples signifies that we are all Pasus and Siva, Pati; hence the name Pasupati for Siva, Its looking towards Siva indicates Pasu i.e. Jiva should seek unoin with Pati i.e. Paramatman. In Siva-linga, God is sought to be represented as having form as well as without form; Saguna as well as nirguna. The three-fold principle of creation, protection and destruction is conveyed in this form. Siva as Dakshinamurti is another beautiful concept. He becomes the cosmic preceptor. His chinmudra where the right thumb and first finger meet while the other three stand away has great philosophical significance. The thumb represents God; the forefinger the individual self, and the other fingers are delusion, toil and egoism. The meaning is: relieved of these three doshas, the individual self unites with the Cosmic self.